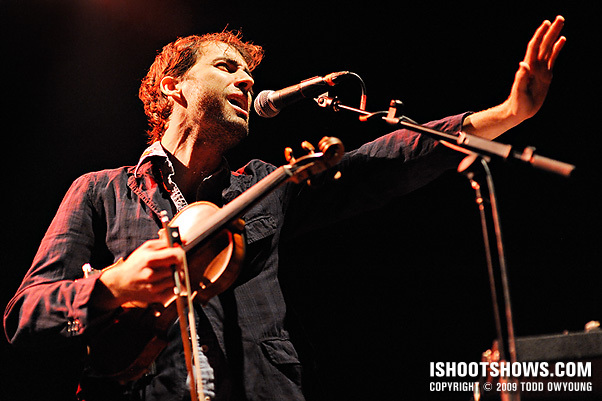 March 15, 2009 – Here's one shot from Andrew Bird's sold out show at the Pageant last night. As always, Bird put on a fantastic show, but his annual performance always has special meaning for me as a photographer. Andrew Bird was the first concert I ever shot with a photo pass, so it's always a treat to catch him as the winter months hurdle toward the vernal equinox. The full set and shooting notes are coming up, stay tuned. I love the Pageant, even if there were only the house lights for this show. I even had to shoot with primes, but a photo pit trumps just about anything. great shot! now i really can’t wait for the oxford show! Thanks, Andrew Bird always puts on a great show. I hope your shoot goes well. yeah, in portland for this show and blondie! there was no barricade. I was totally shocked. I did show up two hours early and basically ended up shooting from one spot anyway, but the options were welcome. To be fair, there are shows I’ve shot at the same venue that were crowd-shooting-only on tours that had photo pits elsewhere.